There have been recipes that I’ve carefully planned, tweaked and experimented with, and failed – time and time again – to get right. To take perfectly edible and delicious (and increasingly more expensive!) ingredients and work and toil and turn them into something… less. But then I’ll stumble on the saving grace. The recipe I improvise – with what I happen to find in the fridge – that tastes absolutely delicious and perfect without any effort at all. 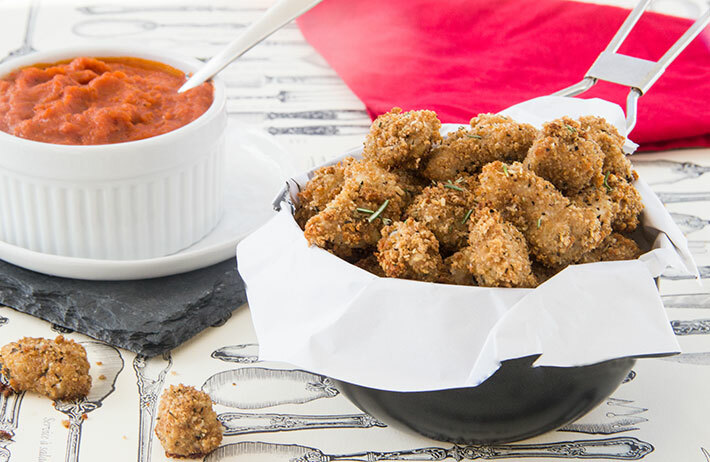 These crispy baked chicken parmesan bites are one of those random strokes of luck. So I just threw this recipe together. It was a lazy day when I didn’t feel like cooking (or washing a lot of dishes later). This is the recipe that becomes a quick and simple, delicious, go-to recipe that Chris and I both love. so easy to make – ready in under 30 minutes. I make a homemade marinara dipping sauce to go along with them – this is where I sneak healthy veggies into the dish. Because homemade marinara sauce is always so much better than anything out of a jar. And this one is ready in under 15 minutes. 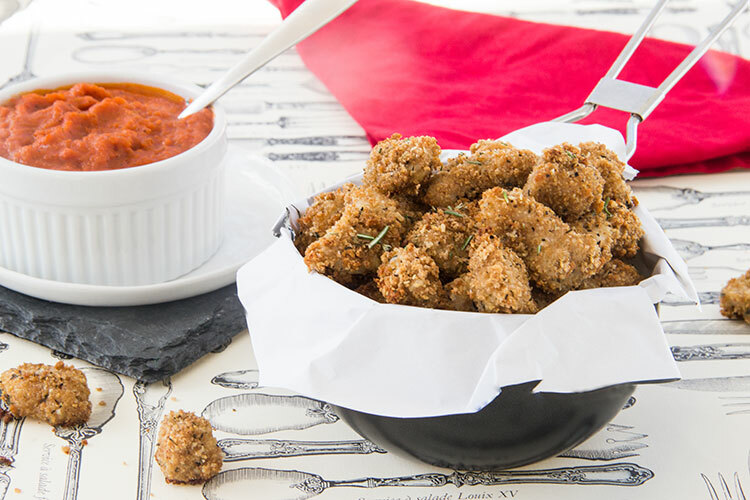 These Chicken Parmesan Bites are really crispy, flavorful and tasty. And they’re just fun to eat. The marinara sauce is extremely hearty and thick, ideal for dipping. Or, I prefer to combine the marinara sauce with some cooked whole wheat penne, topped with Chicken Parmesan Bites. It’s a very tasty, crowd-pleasing pasta dish. Best part: this dish is so quick and easy. I love this one. Thank you random, unplanned Good Luck. Add the following to a large sealable plastic bag: panko breadcrumbs, parmesan, 2 teaspoons garlic powder, and 1 teaspoon Herbes de Provence. Seal the bag and shake the ingredients until everything is well combined. Add the cubed chicken to the bag, seal, and shake again until every piece of chicken is well coated in the breadcrumb mixture. Arrange the breaded chicken on a parchment-lined baking sheet so that no two pieces are overlapping. Sprinkle a bit of salt and pepper over the chicken. Measure a tablespoon of olive oil and carefully drizzle a bit of oil over each piece of chicken. Repeat. Bake in the oven for about 15-16 minutes, or until the breading becomes crispy and golden. Serve. Heat 2 tablespoons of olive oil in large saucepan over medium-high heat. Place the onion, carrot, and celery in the pan and season with salt and pepper. Cook until the vegetables are softened, about 5-7 minutes. Add the diced tomatoes, 1 teaspoon Herbes de Provence, and 1½ teaspoons garlic powder. Stir to combine. Reduce the heat to medium and allow the sauce to simmer, about 5 minutes. Season to taste with salt and pepper. Turn off the heat and puree the sauce with an immersion hand blender (or transfer Marinara Sauce to a blender or food processor to puree). 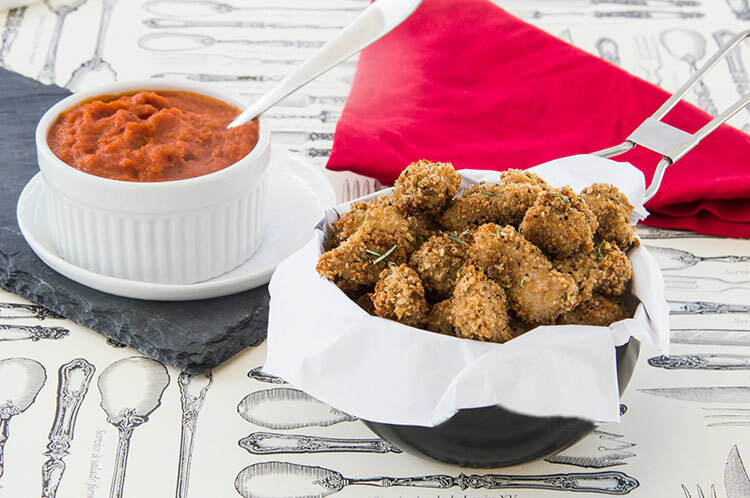 Serve as a dipping sauce for the Chicken Parmesan Bites. Or combine the Marinara Sauce with some cooked penne and top with Chicken Parmesan Bites. 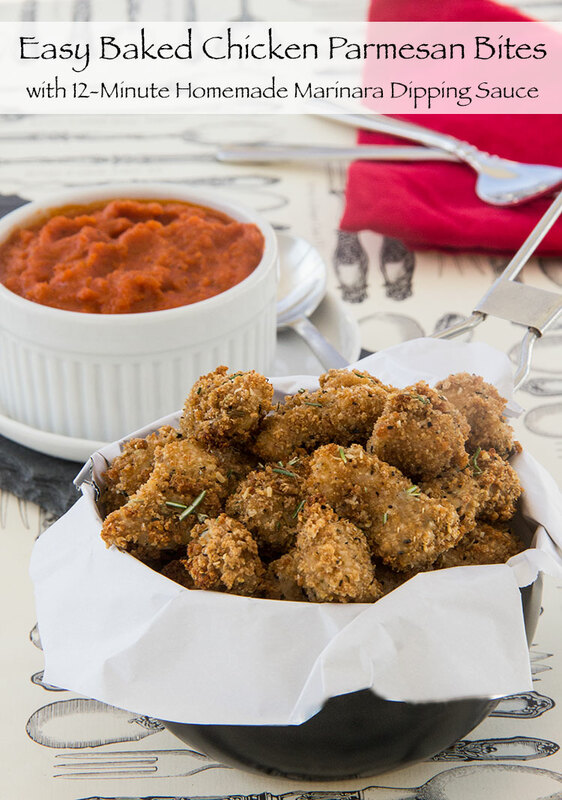 Great party snack, but a lovely appetizer dish too! Wonderful recipe … and I love everything about it – the photos doesn’t make anything less interesting. Love it … but I will use bigger pieces of chicken .. when I do it, you know me. Your photos are stunning as always. My love to you and your two”boys”, 2-legs and 4 legs. And I want that grey and white material you use.. as background. The cutlery one. So nice to hear from you. These bites look so tasty, love when a recipe comes together! 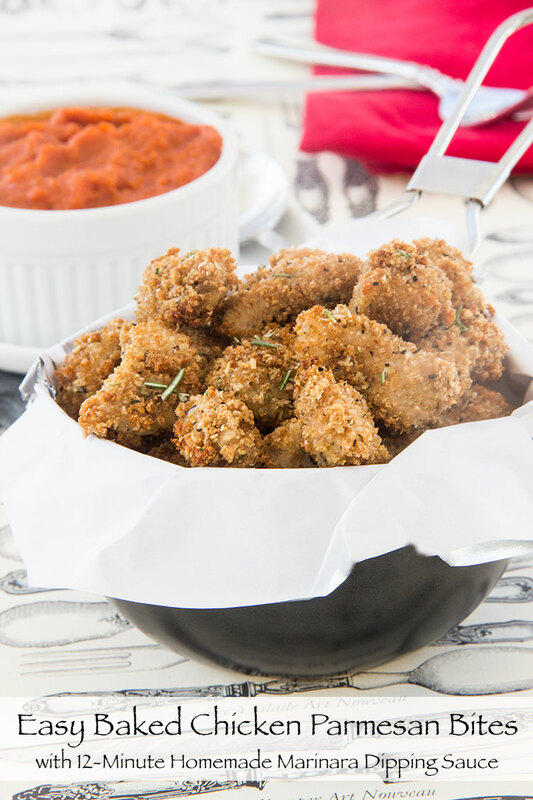 The parmesan-herb coating sounds delish, and I love the marinara dipping sauce! Easy and delicious – yes please! These look so yummy! This is going to be one of our favorite family and party bites recipe! Love the fresh veggies in the dipping sauce too. but more more importantly where did you get your Tablecloth/ placemats from! (the ones with the vintage cake serving thingys….) I Need/Want/Must have! Your marina sauce looks great, but I have to say that this chicken doesn’t need it! With the Parmesan in the crust, I would just want to eat these right out of the oven. Actually, I’m sure the sauce adds a lot to them. What a great snack, lunch or dinner! These are like, what chicken nuggets want to grow up to be. Also it reminded me that I need more herbs de provence! These look so fun and tasty – plus I really like the quick dipping sauce! These look perfect for a Friday night dinner with a movie. What a fun party snack! I could “snack” on this all day! this is definitely a great dish to please a crowd with! This would be a fantastic addition to an outdoor Summer Party Menu – with a tall glass of something nice! 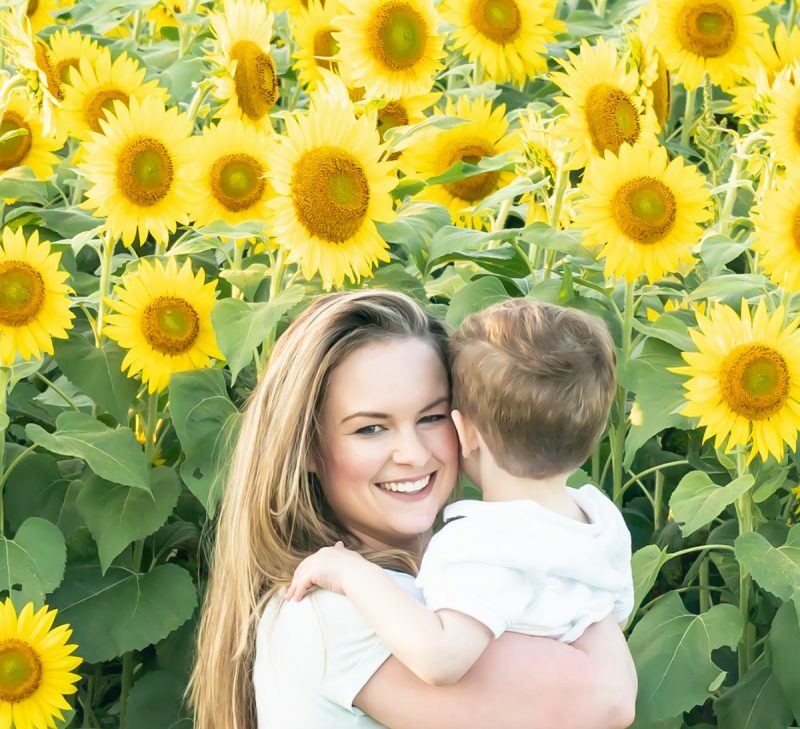 I’m sure they’d go fast x love your photos Jen! These are just… perfect!!! I want my mouth full of them asap. Wow, these look so delicious!! What a perfect snack or appetizer. We love chicken parmesan in my house, and this is such a fun way to eat it. Pinned! Have made these three times now, and my meat and potatoes guy likes them! He even loved the marinara sauce! The panko gives it a pleasantly satisfying crunch — way better than your average breadcrumb breading. I made a special trip to get herbes de Provence and it was worth both the price of the bottle and the hassle of the special trip to the store.